Everything has competition. Most competitors will tell you that their product is better than the next. It’s a pretty bold statement when that is the name of your company: One Better Car Care Products. That is exactly the case here. 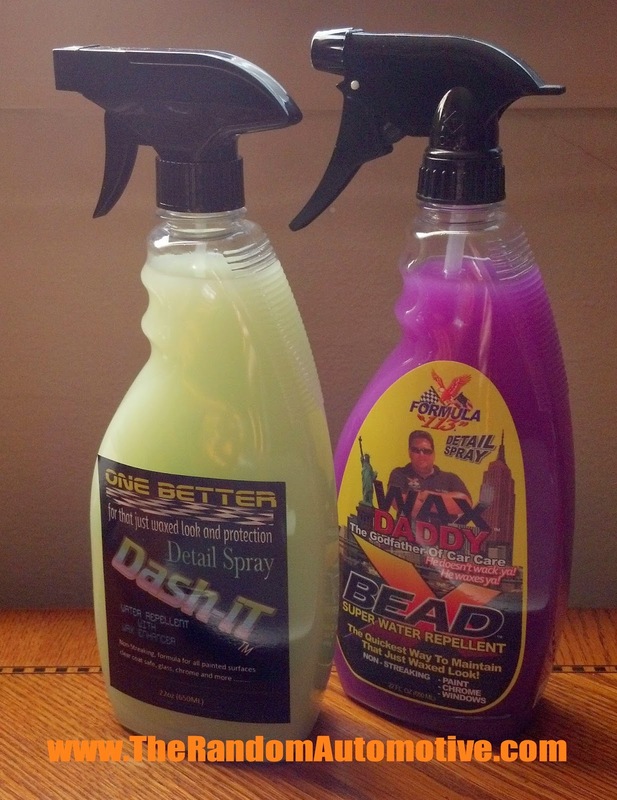 When the Random Automotive posted the review on what I thought was the best quick detailer ever (Bead X), One Better contacted us and said that they had a product that was one better called Dash-iT. We decided to put that statement to the test. This product is VERY similar to our beloved Bead-X. Perhaps the main differences are the color, scent, and Dash-iT has a wax enhancer, along with being a couple bucks cheaper. It’s a spray on detailer that does not contain any abrasives or alcohol. It’s safe on glass, paint, plastic, and chrome, and it’s for that “just waxed look”. Sounding a lot like Bead-X, right? It might sound like I’m comparing this to Bead-X a lot. Well, it’s our benchmark, like the auto industry compares cars to the BMW M3. Anyway, how does it work? Very well. While it may be mind over matter, it seems to spray out a bit thicker than Bead-X. It could be the bottle, or the formula. We were told that we only needed to “dash it” on each section of the vehicle since the formula is more concentrated then Bead-X. A gentle buff with a microfiber towel will take all the crap off the car and leave behind a very smooth, silky finish that feels and looks just like wax. When rain hits the product, it beads up, just like Bead-X. So is this product Bead-X? Pretty much. So I guess the competition comes down to the small stuff. Green? Not liking that choice. The scent is green apple. It matches the color, but I have never been a fan of green apple. It smells good, don’t get me wrong, but it’s not my choice. The scent of Bead-X is intoxicating. Similar to when car guys geek out over the exhaust scent of a carbureted car, or the smell of Hoppe’s 9 to gun owners. All in all, Dash-iT by One Better is a very good product. Compared to Bead-X, it seems equal (except for the scent and color). Would I use it again? While I am a diehard fan of Bead-X, if I can save a few bucks by getting this, then sure. I guess the big question is, is it really one better? I’m not sure about that, but it is a great product none the less. If you have any questions about this product, or Bead-X, feel free to tweet us @TheRandomAuto, or leave a comment below!